Goodreads: Afghanistan, 2009. A Rifle section is halfway through their six-month tour of duty in Helmand Province. Sixteen men from their Battalion have already been killed. Forty-seven others have been wounded and flown back home. The last three months have been tough and it shows. Their kit is in a bad way. They are in a bad way. Young men with tans, scruffy beards, peeling noses and lips burnt raw by the Afghan sun. Despite the hardships they are enjoying their time out here learning how to fight the Taliban. The lads are on their way to becoming the best soldiers in the Army. I got this book because after starting the Nick Stone series by Andy McNab i was hooked so i couldn't wait to read more of this books. 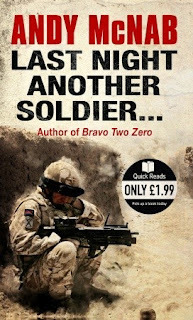 After a rough childhood David Briggs joins the Army, He is loving his job and enjoying serving his country until one night everything changes. With ammunition low and his friend Wounded Briggsy must fight to hold them off! But when one manages to grab him he is worried he could be capture alive! luckily he manages to escape, but he is injured, his friend is dead and anxiety about going back in the field after a close call is kicking in. but the war wont wait, will he make it out alive and at what cost? 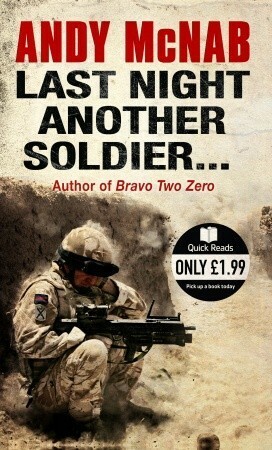 I didn't no what to expect when i read this book, I love the other books I've read by Andy McNab so i wanted to read it. I cried! and not for the normal wimpy reasons i normally do but the book was so real and i felt so sorry for the people i felt like i was right there and the things those poor soldiers go through! I think this book has a powerful message! Our Troops are out there in horrid conditions and putting there lives on the line! and alot of them don't make it home and we should remember them! I also think the end is very powerful. The book also highlights the severity of PTSD, i think it has a good message that we need to support our service men and women, just because they've left the army doesn't mean that PTSD cant occur years later. I thought this was a great little quick read with a very important meaning!